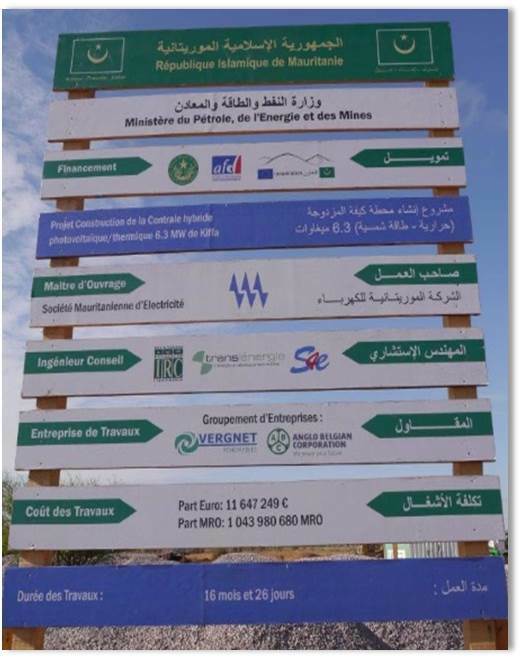 The Mauritanian utility (SOMELEC) issued a call for tender to which the pool Vergnet-ABC Diesel was appointed to deliver the hybrid power plant project in Mauritania. It will be the first of its kind in this West African sub-region. The project integrates the Engineering, Procurement and Construction (EPC) of a 1.3 MWp solar PV plant along with a 5 MW thermal (LFO/HFO) plant. The power plant will be located on a new site close to the town of Kiffa (third most important town in the country) and will supply both towns of Kiffa, Guérou and some other villages in between these two towns. The new plant will replace the existing power plants in the two towns (diesel generators) and will be the only generating station on Kiffa’s isolated electrical grid. To enable a hybrid approach, Vergnet is in control of the entire civil works of the project and the procurement and erection of the solar PV plant, whilst ABC DIESEL supplies and installs the thermal plant along with the 33kV substation. The hybrid power plant will feature the Hybrid Wizard™ real-time controller developed by Vergnet, which will ensure a maximum penetration of photovoltaic power on an isolated and low capacity electrical grid. It will also fulfill, in partnership with ABC Diesel, admissible working conditions for the new thermal plant in terms of minimum loading and spinning reserve management. The advanced solar PV farm will control output and is expected to benefit the population by supplying more than 2 000 MWh of energy, and saving 400 tons of fuel per year. The unique partnership with ABC DIESEL enables us to provide Mauritania with an advance renewable energy solution, the first of its kind in the sub-region. With Hybrid Wizard™ incorporated into the sustainable approach, the isolated and low capacity electrical grid will receive a maximum penetration of photovoltaic power, as the system is controlled in real time. The hybrid approach, encompassing a solar PV plant and a thermal plant, will produce top line renewable results for this sub-region of West Africa.